Technical fabrics demand high quality measures. Depending on the specific application e.g. airbags for automotive industry, fabric defects are unacceptable. A possible reason for fabric defects are faulty weft threads. To fix faulty weft threads in air-jet weaving, modern machines have a system for automatic removal of faulty weft threads. This system has a reliability of about 80 %. In 20 % of the cases, the automatic removal system reports successful removal to the machine but there is still dirt or fragments of the faulty weft thread in the shed. The goal is to increase the reliability of the system for automatic removal of faulty weft threads to 95 % in order to increase the productivity of weaving mills for high quality technical fabrics. The time loss caused by faulty weft threads is reduced. Thus, the efficiency of the air-jet weaving process is increased. 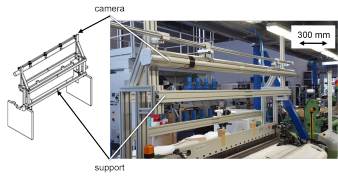 In order to increase the reliability of the system for automatic removal of faulty weft threads, a machine vision system for shed inspection in air-jet weaving machines is developed. The machine vision system checks if the shed is clean after the automatic thread removal proce-dure is completed. In textile industry, weaving is one of the oldest processes and maintains a big share in textile production. In general, weaving employs two distinct sets of yarns and interlaces them at perpendicular angles to obtain fabric. Figure 1 visualizes the principal set-up of an air-jet weaving machine. The warp yarn, which is tensioned in the direction of production, is made available by the warp beam and led to the production area by means of the back rest. Each warp yarn is con-nected with the warp stop motion system, which interrupts the weaving machine in the case of warp yarn breakage. Next, the warp yarn is led in groups through the healds of the heald frames. These rectangu-lar frames create a so-called shed by distinct vertical motion. The shed is the vertical separa-tion between the warp yarn groups and creates an opening for insertion of the weft yarn. In air-jet weaving, the weft yarn is inserted through the shed by main and relay nozzles and finally beaten up by the reed. The finished fabric is transferred onto the cloth roll via the breast beam system. The weft insertion in air-jet weaving machines is not reliable in 100 % of the cases. So-called ‘faulty pickings’ can occur due to e.g. • unsynchronised weft yarn unwinding and picking fluid jetting. The term ‘faulty picking’ defines a weft thread launched by a main nozzle that does not reach the opposite side of the shed within a predetermined time interval. An add-on for weaving machines enables the process to detect faulty pickings, to automatically repair them and to restart the machine. Step 5 is so far the only possibility to verify the functionality of the automated removal system. In 80 % of the cases, the sensor indicates a successful removal procedure and therefore initiates a machine restart although there are fragments of the faulty weft thread remaining in the shed. The automatic restart of the machine makes the process independent from the operator who usually has to remove faulty threads and restart the machine manually. If the automatic removal system restarts the weaving machine automatically despite there are weft remains in the shed, the reed beats up the thread what results in fabric defects, see Figure 2. Because of the lack of reliability, the AFR with automatic machine restart is not used by weaving mills producing high quality technical textiles. Weaving mills that do not apply systems for the automated removal of faulty weft threads have to forego a 10 % increase of productivity. At first, a defect catalogue is created. The defect catalogue contains pictures of weft remains in the shed. The fotos are taken after the sensor indicated a successful removal procedure although there were weft remains in the shed. The defect catalogue is the basis for the design of the machine vision system. The pictures were analysed and clustered into four different defect categories. Examples for the determined defect categories are shown in the following Figures. An example picture taken with this system and classified with a first image processing algorithm is shown in Figure 8. The example picture in Figure8 was taken after a malfunction of the automated removal system. The classification result in Figure8 shows green, blue and red tags. Green tags mean that a thread is in the picture and was successfully recognized. Blue tags appear in case there is a thread in the picture that was not recognized by the algorithm. Red tags mean that the algorithm falsely detected a thread. Further research will be conducted on the improvement and reliability of the image processing algorithm as well as on the validation of the machine vision system in production-like environments. The IGF project 16793N of the research association Forschungskuratorium Textil e.V., Rein-hardtstraße 14-16, 10117 Berlin (Germany) was funded on behalf of AiF in the framework of the programme for funding of the industrielle Gemeinschaftsforschung (IGF). Funding is pro-vided by German Federal Ministry for Economic Affairs and Energy (BMWi).